Remove the plastic top and remove any traces of floss left on the spool. Cut 24-36” worth of thread. This will likely be enough for what you’ll need without adding too much bulk to the spool. Wind the thread clockwise onto the spool. When you only have a few inches left, feed the thread through the left opening on the dispenser and run it through the metal lip on the right. 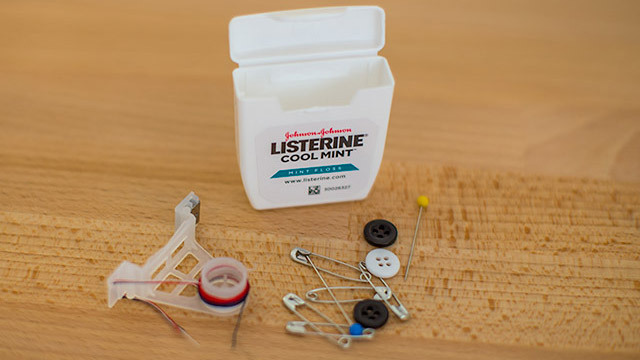 Tuck a few needles or safety pins inside the dispenser. Replace the plastic top once the thread is threaded through.